One day in Shetland we all got in our matching red rental cars and drove to Lerwick to visit Jamieson & Smith, known locally as the brokers. When we arrived, we were greeted by an incredible and enthusiastic fellow, woolman Oliver Henry. Oliver kindly gave us a history of the brokers, along with the story of how the company is moving into the future. He's an expert at sorting and grading fleeces to determine what kinds of uses they might be put to - and there are a lot of uses! J&S makes hand knitting yarns that you're probably familiar with like 2 Ply Jumper Weight, a woolen spun yarn in a myriad of colors that are great for Fair Isle work, along with some newer yarns like their Shetland Heritage, a worsted spun yarn designed to recreate traditional Shetland yarn, and Shetland Supreme Lace Weight, a yarn that mimics the fine lace weight handspun used to create the stunning old cobweb lace shawls. Along with yarn, though, the brokers makes use of coarser grades of wool in home items like duvets, mattresses, and carpets. Needless to say, we were all pretty much in wool heaven getting to hang out with Oliver and all these amazing fleeces. But it got better! Attached to this sorting facility is a shop with yarn and sweaters and books! I couldn't resist picking up the gorgeous yoked sweater shown below (the first of three sweaters I bought in Shetland. I'll have more on this sweater in its own post!) On our last day in Shetland, we got to spend more time in Lerwick, so of course we went back to J&S and bought lots of yarn. I'll be swatching in some of my J&S yarn this week, so keep an eye on my Instagram to learn more about it! The colourful image of J&S yarn below is Jessica Forbes' swatch for Ysolda's Cruden vest. 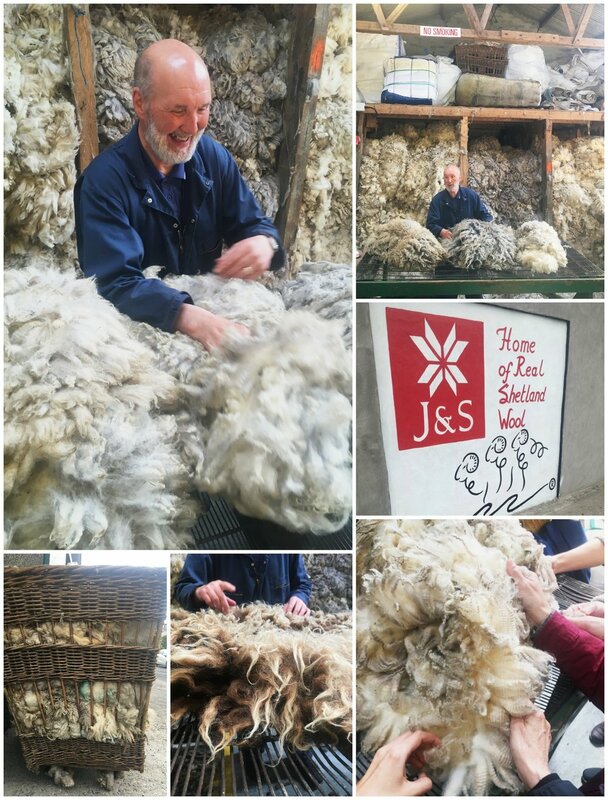 If you want to know more about Jamieson & Smith, Oliver, (and other Shetland wool folks), I highly recommend picking up Kate Davies' & Tom Barr's book Shetland Oo. It's full of stunning photos and excellent short profiles. I picked up my copy from the Shetland Museum and it's a treasure. September 7, 2017 edited to add: I swatched with Jamieson & Smith 2 Ply Jumper Weight. You can Read about it in the Swatch Project.